Winning WhatHiFi’s speaker of the year award has firmly put Audio Pro on the mainstream consumer radar. In fact, it was this award that prompted me to go out and buy myself the Swedish made Addon T3. Admittedly… mainly to see if all the fuss is warranted… or it’s just consumer hype? Also to find out if there are any glaring cons to consider (hint hint)… that have been missed out from some of the more mainstream reviews. 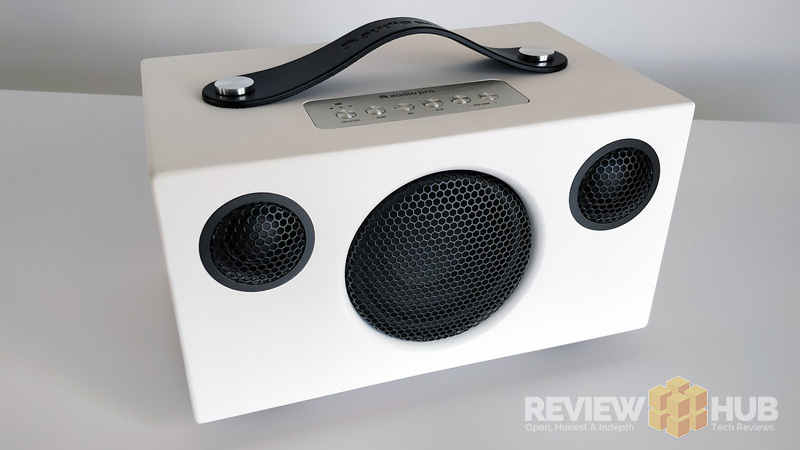 Currently on sale for around £150 / $210 USD, this isn’t a speaker that you buy on a whim. It’s a speaker that needs to perform. 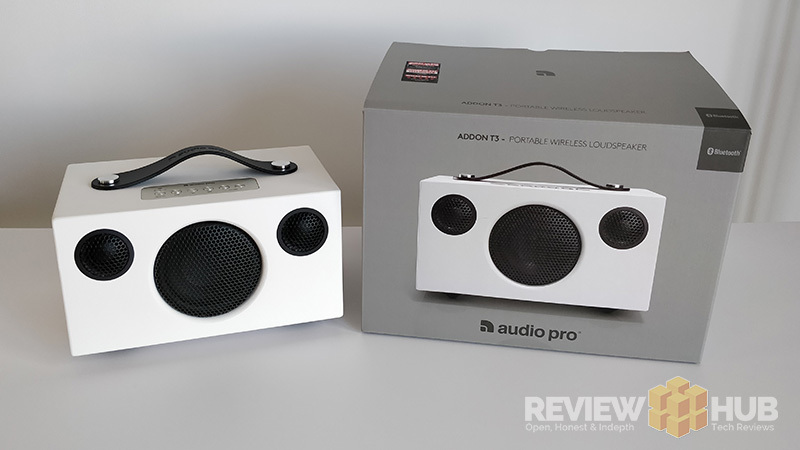 So let’s see how the Award-Winning Audio Pro T3 Bluetooth Speaker performs when we test the Sound Quality, Design & Build Quality, Connectivity & Battery. Finally, I’ll be giving ‘The Verdict’ on whether it warrants that premium £150 price-tag. As other audiophiles have suggested, I played the speakers for over 30 hours before a making judgement. I’m not sure this does anything at all… but now nobody can complain they haven’t been “broken in”. 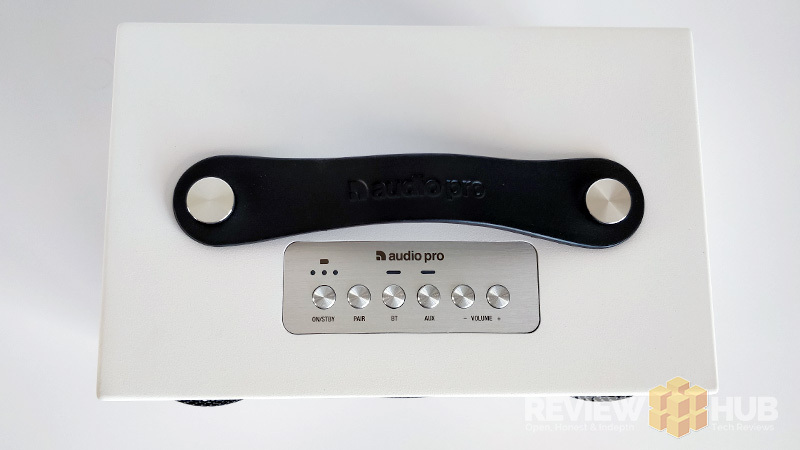 With over 30 hours listening behind me, here’s what I think of the Audio Pro Addon T3 Bluetooth Speaker… from one layman to you. Let’s start with my biggest T3 Audio Quality issue… volume. This speaker really underperforms at low volumes. It sounds closed in, voices lack depth, and you wouldn’t think it was anything more than a £50 speaker. 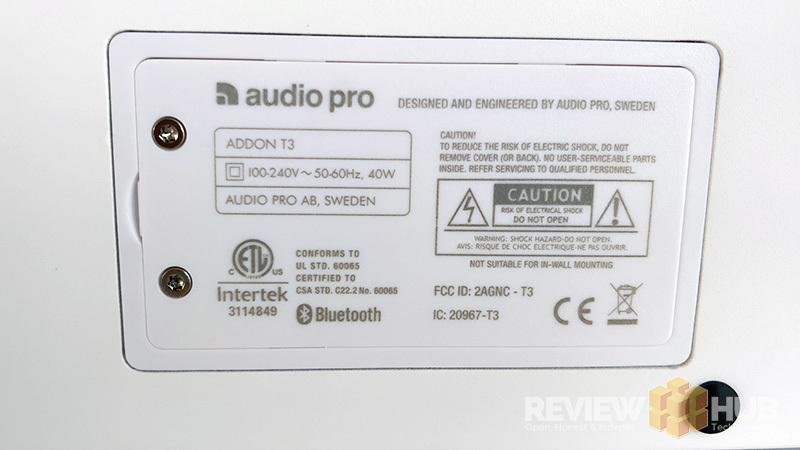 I almost thought that my Addon T3 was faulty at first… having read all the rave reviews. But then I stood corrected. When you crank up the volume to around 70%, the soundscape opens up massively. Voices become rich, brightness improves and you start thinking… ‘hell yeah… this speaker is good!’. No problem here then, right? Well, yes actually. In fairness, the bass works well at any volume but can feel slightly overpowering at lower volumes making voices lose some clarity. I played around with an equaliser on my phone, but this just felt like extra-effort and didn’t help much. Considering I’d already forked out £150 for the speaker… i didn’t want this extra step. If you like to listen to your music loud? Then you’ll love the Addon T3. It really is superb once it hits its volume threshold. It offers excellent bass and superb clarity in the mids & highs. Huh? What happened to the Brown & White Addon T3? Side Note: What attracted me to the Addon T3 was the brown leather handle found on the white model. This contrast looks sophisticated and high-end… reminding me a lot of B&O’s range. Well, it turns out this model doesn’t exist anymore and has now been replaced by the black leather handle design. This is model I received… and the model which left me feeling disappointed, design-wise that is. 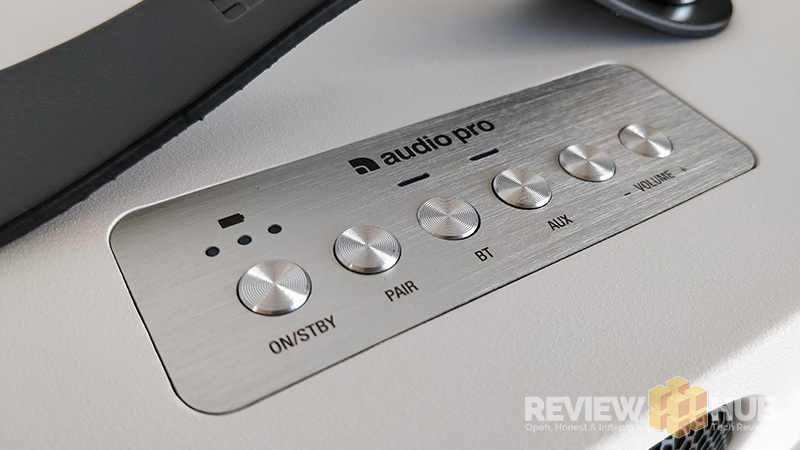 The design of the Audio Pro T3 stands out… in a minimalist… not standing out at all type of way. I’ve been testing the Marshall Acton speaker at the same time as the Addon T3 and I’m feeling confused. The Stanmore is so much fun with the AMP design, solid twist buttons and even comes with a premium coiled 3.5mm cable. On the top of the speaker, there’s a metal plate which features the 6 buttons to operate the T3. Unfortunately, on the model I received 2 of these buttons are a little too recessed, ruining the otherwise streamlined top. The handle on top is made of a sturdy leather, and is just about big enough to fit a few fingers under for carrying. If you suffer from the common ailment… sausage fingers… you may struggle. 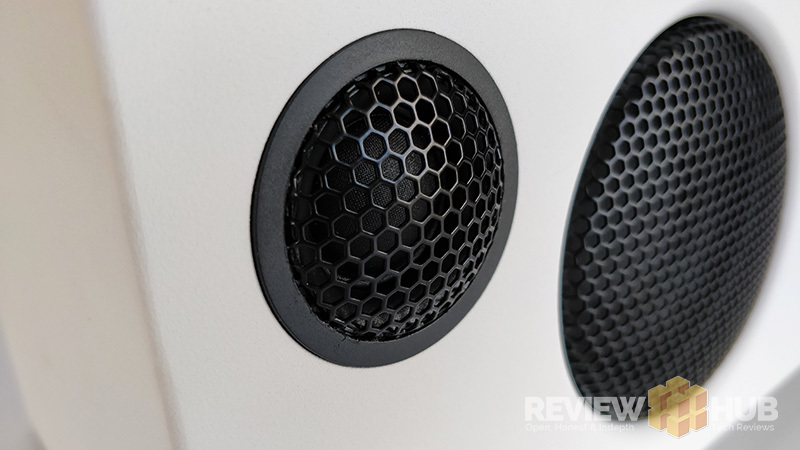 Running your hands over the surface of the speaker isn’t what you’d expect. The surface is coated with a slightly course texture paint. The reason behind this? I’m not sure, but let’s hope it doesn’t become a dirt magnet… too late… it’s a dirt magnet. I’m going to get my unit replaced which should fix the button issue. Then I’ll be back to update the build quality. The battery life on the Audio Pro Addon T3 is incredible! 10/10! I’d go as far as saying it’s got the best battery life out of any Bluetooth speaker I’ve ever had my hands on! You can literally get 30 hours out of the T3 with high-volume. I’ve only cranked the volume up to 100% once for testing and even then Audio Pro quotes 12 Hours playtime. Connectivity with the Addon T3 is simple. It uses Bluetooth 4.0 for connecting to your smartphone or BT enabled device. There’s also as Aux on the back for a wired connection. (Cable not included). The Bluetooth connection works perfectly, connects with the last device speedily and only showed the odd bit distortion when moving too far from the speaker. The other extra connection you get on the T3 is a USB slot. This is for powering your devices when listening to music on the go. 5V / 1000mA output. 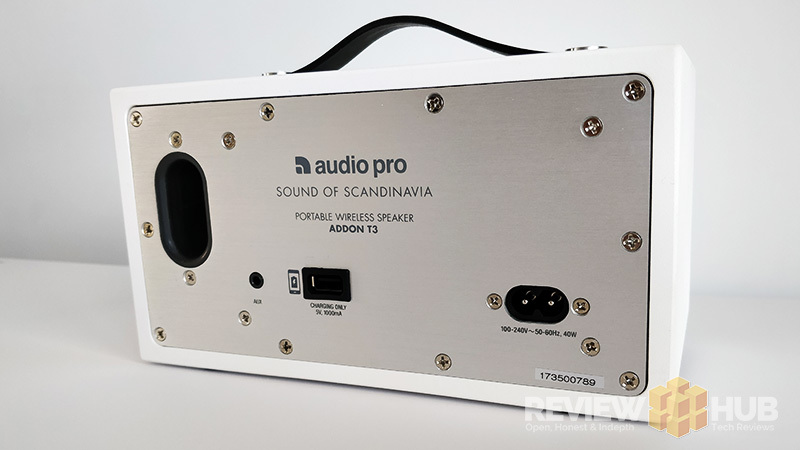 I really want to love the Audio Pro Addon T3 speaker! For me, the perfect Bluetooth speaker has to adapt to all my listening needs. I want it to play crisp and clear at low volumes with plenty of atmosphere but be able to pump up at picnics and parties. Maybe I’m asking too much. What do you think of the Addon T3?